Complete a foundation level training and receive Certificate in Domestic Abuse OCNLR Level 3. The first eight days of all of our foundation courses cover what we consider the core essentials for anyone working with victims of domestic abuse. The final four days focus on a specialist subject: Idva, Isva, working with young people or Outreach. Our expert level courses are designed for learners who have already attended foundation training in one subject and want to top up their knowledge by attending a shorter (four day) course in a new field. Complete two expert-level training courses and qualify for the diploma Domestic abuse: prevention and early intervention. You will need to have completed SafeLives foundation training in order to take up a place on an expert course. We will also accept learners who have completed Women's Aid's Certificate in Tackling and Preventing Domestic Abuse. We know budgets are tight and so we've worked hard to find ways of making our training more affordable for you. Read more about subsidies for SafeLives training. We asked how we could make our training better and you told us you needed training that was more flexible and more affordable whilst ensuring it was the same high quality training that you expect from SafeLives. You told us and we listened and adapted our training programme accordingly. Our new approach allows for much more flexibility - hugely reducing the cost to you and the time you spend away from your job. Watch our short Prezi below to find out how you can make the most of our training. Complete a foundation level course (you may already have done so if you have attended our Idva or training of responding to young people affected by domestic abuse) before topping up your knowledge with shorter, expert-level courses at a later date. We want you to feel proud and confident in your role as a highly qualified professional, which is why all of our courses continue to be accredited by OCNLR. One foundation course will gain you a certificate in domestic abuse. 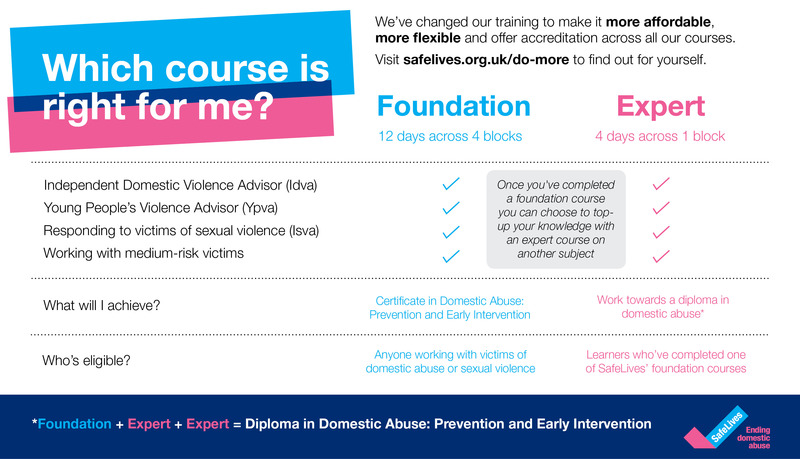 Complete an additional two expert level courses and take home a diploma in domestic abuse. We are continually looking for ways to improve our training. You told us that cost and taking time away from clients was a real concern for you which is why we introduced the two-tier foundation and expert training levels. We estimate that if you want to continue your studies with us you will pay just a third of what you would previously, once fees and time out of the office are taken into consideration. 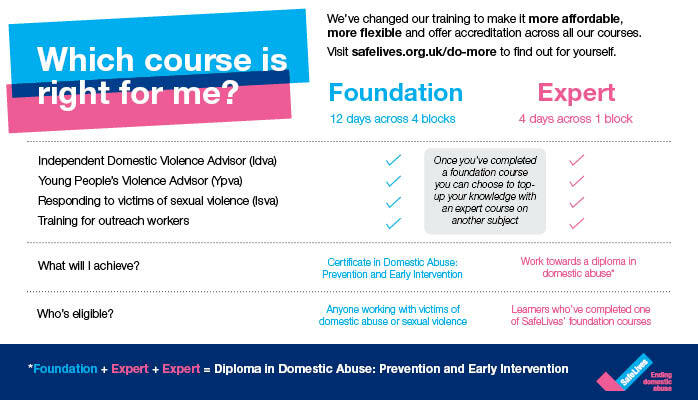 If you would like to make any suggestions regarding how the courses are structured, the type of content or subjects for new courses then feel free to contact us at: training@safelives.org.uk. SafeLives Community is a free platform designed to connect professionals working in the domestic abuse sector. Join to share best practice, take part in discussions and access exclusive content.